Have you saved everything to My Drive or My Documents with no organizational system? It’s hard to be productive and organized in your business if you can’t find what you are looking for on your computer. In just a few short minutes, you can set up a system that works for your business so you can find any file on your computer when needed. It is highly recommended that you use cloud storage for all your files and not your hard drive on your personal desktop or laptop. If your laptop crashes and you haven’t backed it up (there is a high likelihood this would happen on an important launch day! ), you would lose all your important files. You can use Google Drive, OneDrive or Dropbox for cloud storage. I have accounts with all three services, but I have the most storage on Google Drive so that is what I use for my business files. The key here is to do something that makes sense for your business and how it is organized. It should mirror how you work or the categories of your business. In my example below, in my Google Drive, I have the following nine folders. 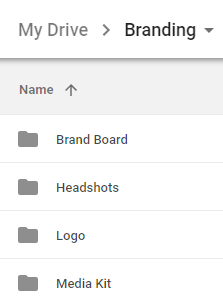 Branding: This is where I store any files related to my logo, headshots, media kits, fonts, and brand board. Content Management: This folder contains anything I consider related to content management. 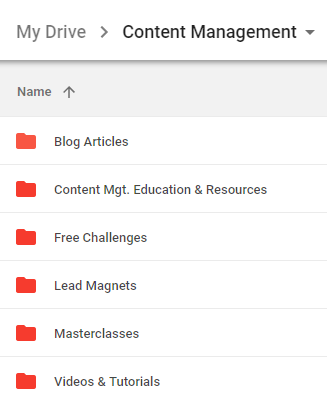 Blog, videos/tutorials, and content created for lead magnets. It’s the value-added content I create for my audience. Courses: This folder includes any content (e.g. presentations, cheat sheets, and worksheets) I create for my courses. Educations and Resources: This is where I store anything that is education in nature or resources that will help me in my business. Financials: This includes budgets, receipts, financial projects, and anything that is tax related that I need to save for my accountant. Instagram: I keep a special folder for Instagram; I have a monthly subscription service for an Instagram program and I store everything Instagram related in this file even though I consider this to be a marketing function. Again, keep your file system personal to how you work. Legal: In this folder, I store everything that is legal related to my business like my website and course policies and procedures. Marketing: This folder holds everything that is marketing related. Website, sales pages, webinars, etc. Other: The other folder is a catch all folder with very few files that don’t fit in any of the other categories. I highly recommend that you set up an “other” or “miscellaneous” folder for files such as this. Does the date matter in your work flow? Do you work on projects? Does the version # or the status of the file matter such as approved, up for review, etc? Sub folders are where the true organization happens. In my example below, I have several sub folders under Branding. Brand Board: This folder contains anything related to my brand board such as my brand and font colors. Headshots: This folder contains headshots that I use for my website and media. Logo: This folder contains all logo related files for easy access. Media Kit: This folder contains anything related to media. You may decide to organize your sub folders by date, by project or by client. Under my Blog Articles sub folder, I have additional sub folders organized by month. If you are a visual person, you may like to color code your files. For instance, in my system, I color all the sub-folders under Content Management red to keep them consistent with main folder. To change the color on a folder, right click while you are on the folder, scroll down and select Change Color. To change the color of multiple folders at once, hold down the ctrl key when you select the folders, right click, and select Change Color. In Google Drive, don’t forget that files which have been shared with you, will not automatically show up in your file folders. You will need to add the file to the appropriate folder on your My Drive. You can do this by right clicking on the file and selecting Add to My Drive. Do you have files that you aren’t using anymore, but are afraid to delete them? Create an archive folder for storage. Out of sight, out of mind! What about you? Any additional tips you want to share for organizing your computer files?